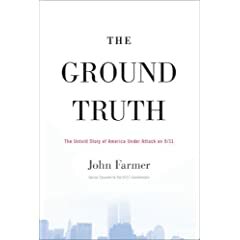 "All Americans should read John Farmer's The Ground Truth. With keen analytical insight, Farmer rips the lid off of many mysteries pertaining to both the 9/11 attacks and Hurricane Katrina. A highly recommended historical curative for our times." "No one is more qualified to write the definitive book about the tragedy of 9/11 than John Farmer. Fortunately, he has done so. Even more fortunately the language is clear, alive and instructive for anyone who wants to make certain this never happens again." "In revisiting the tragedy of the 9/11 attacks that still haunt America, John Farmer provides a devastating account of how what government and military officials told Congress, the 9/11 Commission on which he served, the media, and the public 'was almost entirely, and inexplicably, untrue.' The result is a major, carefully documented and deeply disturbing book, one that deserves the most serious attention of every American concerned about our future." --Haynes Johnson, Pulitzer Prize winner and best-selling author. "Revelatory-Farmer makes shattering new sense of the day's events and exposes the true disarray and arrogance in the military and government responses." This page contains a single entry by writch published on September 21, 2009 9:41 AM. DIVORCE VS. MURDER was the previous entry in this blog. Flexibility is the next entry in this blog.